The pick n mix hire is a great attraction at events, especially the ones where your guests need a quick sugar fix. We hire pick n mix carts to a wide range of clients from nightclubs to exhibitions, where the chance of a free bag of sweets will attract many guests to your stand. ”Pick n mix hire is great”. The format is simple, you have around twenty containers all filled with delicious sweets, we provide the scoops, the bags and the staff if necessary. Guests can help themselves and they love nothing more than seeing their old favourite sweets. Pick n mix hire for weddings and parties. We normally provide a range of boiled sweets, jellied sweets and bon bons etc – keeping away from the chocolate ones, (but if you want a chocolate fix why not hire our chocolate fountain). We hire the sweet carts to a wide selection of events, and the pick n mix carts are great attractions when guests have long days like weddings and conferences, a few sweets quickly raises spirits again. The pick and mix sweet stall is a great attraction at events. The Pick and mix is an old fashioned favourite. Pick n mix sweets at parties, events and exhibitions are great. The pick n mix stand gives all the guests the chance to fill their bags with the sweets they like. It is like being a kid in a sweet shop. The pick and mix sweet stall is a great attraction. The pick n mix sweet stand is on wheels so totally mobile and comes with the hygienic scoops. The Pic and mix sweets and the pick & mix sweets are a mixture of old time favourites. The pick and mix stands are great fun for all guests. The pick and mix stand is brightly coloured so attracts attention. 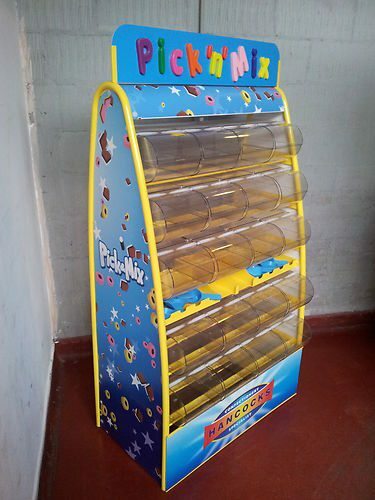 We hire pick and mix stand fun to parties and events. We hire pick and mix stands to exhibitions. You can hire pick n mix sweet stall fun for any party. To hire pick n mix sweet stand give us a call. We hire pick n mix sweet stall to exhibitions and it always draws in the crowds. Why not hire pick and mix sweet stand for your next event. The pick n mix hire is great and are available throughout the UK, they are always popular, and when we pack the carts away, it is rare we have to empty the containers, for multiple day events when you hire the pick n mix cart you can buy more sweets and just top the containers up as required. We also hire the sweet carts if you want a more traditional feel to your event, or perhaps have both? The pick n mix hire is great fun for all ages.